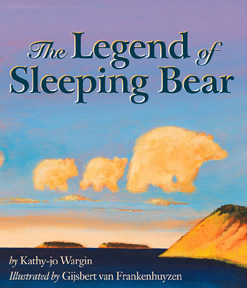 "The Legend of Sleeping Bear" is the story of a mother’s eternal devotion to her young. The book is based on a native American legend of the creation of the Dunes and Islands at Sleeping Bear Dunes National Lakeshore. 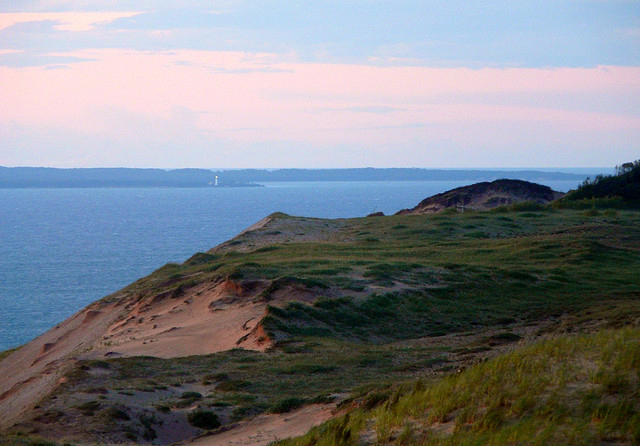 The South Manitou Island "cub" is resting nearby the "momma bear" (the Sleeping Bear Dunes). The cub's sibling (the North Manitou Island) sits close-by to the northeast. Sleeping Bear Dunes National Lakeshore, Wisconsin; photo by Jim (Jimflix) on Flickr (noncommercial use permitted with attribution / no derivative works).